Fianna Fail's housing spokesperson Barry Cowen. FIANNA FÁIL HAS defended a proposed Vat cut for builders that could cost the exchequer €240 million, saying that “real urgency” is needed to fight the housing crisis. 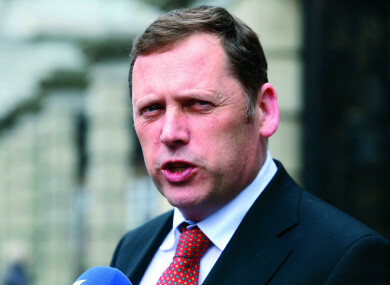 The party’s housing spokesperson Barry Cowen outlined the plan to the Sunday Business Post and said that it is just one of a suite of measures that should be introduced to increase the supply of new housing. Cowen’s proposal aims to reduce the cost of construction for builders by reducing the Vat they pay on supplies from 13.5% to 9% for a three-year period. Revenue has estimated that such a cut would cost €240 million. The Construction Industry Federation has argued that it would in fact be self-financing because more building would take place as a result of the cut. Sinn Féin responded to the plan yesterday by calling it “breathtakingly stupid”, but speaking on RTÉ’s Morning Ireland programme today Cowen said that action is needed. “Nobody has the high moral ground here,” the Offaly TD said. I’ve no time for the naysayers or the critics or the cynics, it’s not a time for political point-scoring, it’s a time for real urgency and I think that this measure, in amongst others, is something that has to be put in place in order for houses to be built because that is the problem here. “The big issue and one of the obstacles to houses being constructed, builders will tell you, is that the cost of construction is not allowing them to enter into the construction sector. So we are merely seeking to stimulate activity in order to be in a position to construct more homes and to allow more solutions,” Cowen added. Sinn Fein’s finance spokesperson Pearse Doherty reacted angrily to Cowen’s pledge, claiming that the idea showed Fianna Fáil up as “the developer’s party”. “There is nothing radical in these proposals at all. These are old-school Fianna Fáil, McCreevy-style policies and we all know where they lead us,” Doherty said. We are living through a serious supply problem and, despite all the evidence of a dysfunctional market and the very worrying influence of property funds snapping up huge amounts of newly built property, the best Fianna Fail can come up with is a tax break for their friends, the builders. Cowen remained defiant in this morning’s interview however, saying he “won’t apologise” for trying to solve the housing crisis. “It’s a small price to pay in relation to the situation we have presently. You’ve seen three people unfortunately die and we haven’t entered the winter yet. We’ve seen a special all-party committee make recommendations over a year ago, many of which have not been taken on board,” Cowen said. Email “'You’ve seen three people unfortunately die' - Fianna Fáil defends planned tax cut for builders”. Feedback on “'You’ve seen three people unfortunately die' - Fianna Fáil defends planned tax cut for builders”.